Oh Sucklord, you make the best toys. Lucky San Diego Comic Con attendees will be able to grab a bunch of new stuff from the king bootlegger himself at the DKE Toys booth #4728, so let's give everyone the rundown of all the things you won't be able to own without having to sell your car. First up, everyone's favorite ambiguous space pals are admitting to everything in this special edition Gay Enterprise 2 pack. We all had our suspicions and now they've been confirmed in this special release. Only 30 of them were made and it'll cost you $150 to piss off every Star Trek fan you've ever known. Totally worth every penny. I detect we're gonna have a theme going here. There was a lot of questions that were never answered in the Peanuts comics. What was actually in Snoopy's dog house that prevented him from sleeping in it? How come Pigpen's parents didn't shoot him with the water hose? Why wasn't Linus the victim of bullying for dragging his blanky around? But we all knew what was going on with a certain Birkenstock wearing sports fanatic. Not that there's anything wrong with that, it's just nice for clarity once in awhile. There's only 70 of these figures in existence and they can be snatched up for $45. This one I didn't see coming. How come TMZ didn't cover this? When Clay Aiken announced he was gay it was front page news, but who was really shocked about that? The Transformers always seemed so....manly. Once you recover from this shocking revelation, you can then buy one of these 40 "fabulous" figures for $125. I present this picture without description. Only 9 of them are available for $150 each. 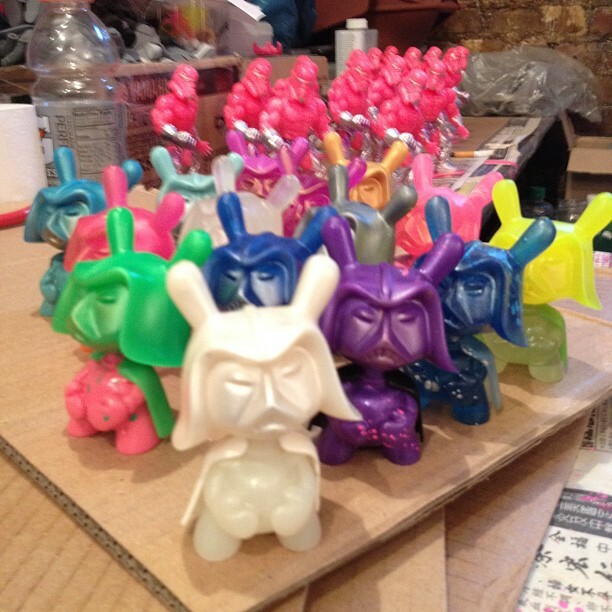 Sucklord will also be carrying around a bunch of these little dudes featuring the head from his Dunny 2012 case exclusive. All you gotta do is find him, put $40 in his hand, and he'll give you one. I would try and wait until he's using the bathroom, just to make the transaction that much weirder for everyone involved. Don't forget to ask to take a picture with him.